While it doesn’t have the snappy working title of the show Rashida Jones is developing at AMC, the people behind Halt And Catch Fire are also working with the network to put together a writers’ room for a new show of their own. 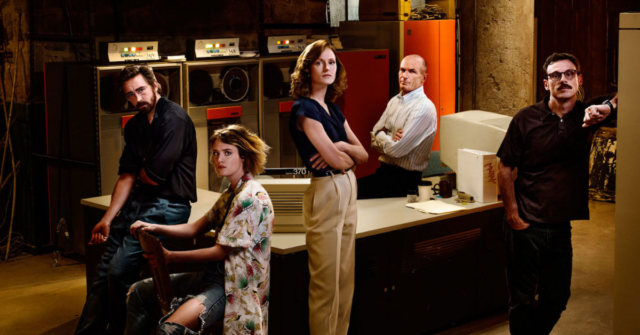 According to Deadline, the project is called Rainy Day People and it comes from Halt And Catch Fire creators Chris Cantwell and Christoper C. Rogers as well as Halt And Catch Fire executive producers Mark Johnson and Melissa Bernstein. Considering how much a small but very dedicated audience flipped out over the ‘80s computer show, this could be a big deal. As for what the show is about, it’s a workplace drama set in a “wellness center-style mental health and rehab facility” that centers on the patients and staff who have stayed/worked at the center “in its various incarnations for the past 50 years.” That last bit seems like a hint at some kind of clever twist, perhaps giving Rainy Day People a chance to explore how society has changed in the past few decades by looking at it through the lens of mental health treatment. If that still doesn’t quite do it for you, allow us to bring up another intriguing possibility: Maybe Lee Pace will be there!